The essentials of Navajo culture are woven into every textile they made, even though most were intended for the Anglo market. 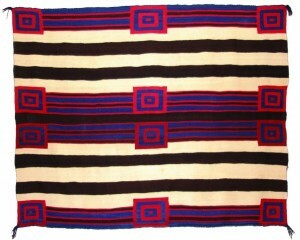 On June 19, 2012, at John Moran Auctioneers in Pasadena, Calif., a remarkable piece of woven wool, off-white with brown, blue and red stripes, sold for $1.8 million. It was a very rare early Navajo “chief’s blanket,” made around 1850 and consigned by a descendant of the Norwegian immigrant storekeeper in the Dakota Territory who got it in a trade in the 1870s. Since then, the blanket had remained in the man’s family, never shown publicly despite its historic importance and never even washed. As a result, its condition was excellent. Moran estimated it at $100,000–200,000, so the final price—the record for a Navajo blanket—came as a life-changing surprise to the consigner, who was by no means wealthy. 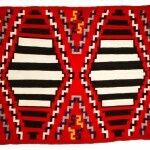 Even to insiders in the world of Native American art, though, it was a lot of money; the previous record for a Navajo blanket, set at Sotheby’s New York in 1989, was $522,500. It was also the second-highest price ever paid at auction for any American Indian art object. That a Navajo textile should attain such honors in the marketplace is fitting, considering that the tribe has one of the greatest weaving traditions in the Americas. But in many ways the blanket sold by Moran was atypical. If anything, it’s far less colorful and aesthetically sophisticated than most that are available today; it was expensive on account of being a once-in-a-lifetime rarity. 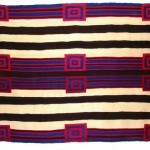 It’s known as a “First Phase Chief’s Blanket,” referring to one of three stylistic periods or phases from around 1800 to 1868, when the Navajos returned to their homeland in the Four Corners region of northern New Mexico and Arizona from a five-year exile that decimated the population. Very few textiles survive from that era, and anything from before 1800 is almost certain to be nothing more fragments of cloth at this point, essentially an archaeological specimen. Also, it was made by Navajos for Navajos—in fact, as apparel to be worn, though not by a chief because the Navajos have no chiefs. Most Navajo textiles, however, were made for outsiders, at first to be traded with other Indian tribes and white settlers, and later for the tourist and collector markets. 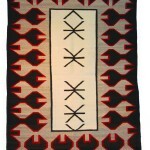 One of the most interesting things about Navajo blankets and rugs is that, like several other very worthy “indigenous” art traditions around the world—notably Australian Aboriginal art, Canadian Inuit art and certain traditions of Mexican Indian silver—it was strongly influenced by whites and to some extent even instigated by them. Nonetheless, while meeting the demands of non-Indian America and thereby providing the tribe with much-needed income, Navajo weaving kept pace with changing times while staying true to Navajo traditions, aesthetics and ways of working (vertical-loom weaving using hand-spun thread). This quality of adaptability is particularly characteristic of the Navajo people (known in their own language as Diné), who over the centuries have always known how to borrow from their neighbors and change with the times without losing their identity. The Navajo textiles that are available to collectors today fall into several categories. Around 1880, after the three “phases” of the so-called classic period (which added geometrical complexity to the designs by going from pure stripes to serrated forms and diamond shapes), the so-called “transitional period” began. 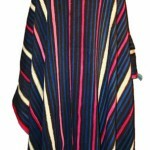 This term refers to the transition from making blankets designed to be draped over the body as clothing to making rugs. Transitional-period weavers developed the famous “eyedazzler” design, a bold, almost hallucinogenic zigzag patterns that would become more widely used later on. The transitional period also saw the introduction of commercial, machine-spun yarns from the Eastern U.S., particularly those from Germantown, Pa. Previously the Navajo had spun yarn from the wool of the sheep they raised themselves. The industrial dyes in the Germantown yarns gave Navajo textiles a vividness of hue that they had never had before. 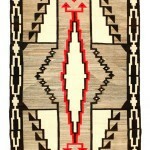 In the 1880s, the modern period of Navajo rugs began, and the influence of Anglo society intensified. That took place due to the rise of a new economic system on the reservation—the trading posts. White traders became the Indians’ connection to the outside world, selling them supplies, selling their weavings for them and in return providing them with credit. Since the traders had a canny sense of what their white customers wanted, they suggested to the Navajo various designs and color schemes that they felt would sell well. Some of the top traders were so influential in this way that they co-created so-called regional styles, named after their trading posts, such as Ganado, Crystal, Two Gray Hills, Teec Nos Pos and Wide Ruins. Michael Smith, a Navajo textile specialist dealer in Santa Fe, N.M., points out that some of the trading post designs were influenced by the popularity of Oriental rugs in the U.S. at the time. “The traders played a big part, influencing and encouraging. The Navajos were very adaptable—if the traders wanted them to weave differently, well, they said, we’ll weave differently. The Pueblo Indians seemed to stop weaving, because they wouldn’t weave rugs. The Navajos went in the other direction and got incredibly good at it. It’s unreal—some of these weavers reached a level where they were masters of anything they wanted to do, especially Two Grey Hills and Teec Nos Pos.” The traders sold to tourists brought out to the Four Corners region by the expanding railroads, fired with a newfound appreciation of Western scenery and culture. But as Henry Monahan of Morning Star Gallery in Santa Fe points out, they also sold to collectors back east through catalogues, which offered the same design in various convenient sizes. The heyday of trading-post rugs lasted until just after World War II, when the local economy changed and the old patronage system of giving credit for the six months to a year it took to weave a rug gave way to the pawn-shop system. Even though a First Phase ( or any phase, for that matter) blanket is likely to be out of reach, collectors today can acquire excellent examples of textiles from the 1880–1950 period at prices that are not at all stratospheric. Smith says that small rugs can start at a couple of thousand dollars and go up to around $20,000. Saddle blankets—the only type of blanket the Navajo kept making after the end of the wearing-blanket era—are small, too, but command something of a premium due to their special purpose. A larger rug from Teec Nos Pos or Two Gray Hills, 6 by 11 or 6 by 9 feet, would be between $25,000 and $30,000, while a 4 by 6 Teec Nos Pos would cost a little under $10,000.